Everybody knows that a standard issue rock biography or online lists of stats and facts is nowhere near being gratifying enough for a fervent fan, especially when it comes to the expect-the-unexpected but prolific and almost willingly perverse Neil Young. There are other artists and examples just as confounding to the fair-weather fan that spring to mind: Bob Dylan with his restless penchant for perennial retooling, Elvis Costello’s spice-spiked variety platters, the hejira and hissing of some free-spirited promise by Joni Mitchell, Lou Reed’s ever-new sensations and metal-machine maneuvering, and the chameleonic David Bowie doing his, oh, chameleonic thing, among others. 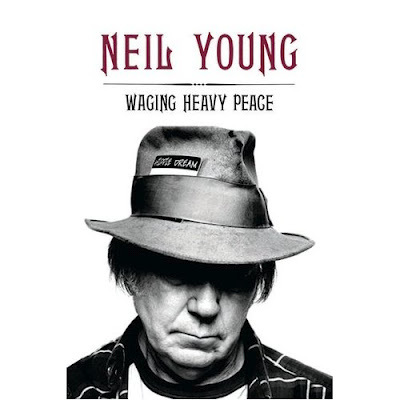 The long-haulers among the Neil Young faithful, however, know that though there may be detours and ditches, all roads really lead to an iconoclastic and individualistic adventurousness seemingly ingrained within the fierce independence of this uncompromising artist. Forever young and still rockin’ in the free world (well, 28 countries, to be precise in what must be a frequently answered question), Neil Young has released, in the span of his career since his 1968 departure from the Buffalo Springfield: 34 solo albums, eight live albums, 33 studio albums, 59 singles, and four soundtracks. He has also released five albums with Buffalo Springfield; 12 albums with Crazy Horse; five albums with Crosby, Stills, Nash and Young; and one album each with Graham Nash, The Squires, The Stills-Young Band, the Shocking Pinks, the Bluenotes, and the Restless. As for his performances, according to one statistician, Young has logged 88 tours, 1800 shows, with nearly 29,600 songs played live. And this isn’t even including the concerts with his various bands and side projects, and, of course, his Motown years with the pre-braided, super-freaky Rick James. Can’t forget the Motor City–and a short-lived early stint with the early-’60s group the Mynah Birds fronted by Young and the also short-lived punk-funk pioneer. However, after the American naval authorities got in touch with the can’t-touch-this, AWOL Ricky James Matthews, the music world would have to spin without–as author Glen Boyd puts it in his exhaustive, and no doubt exhaustingly researched–treasure trove of all things Young, the “world’s first ever folk-rock-punk-funk supergroup.” Though I’m not sure that Young was inclined to master the “Temptation Walk,” or bust some other choreographic moves, the prospect would have at least made the Mynah Birds, minus-Rick James, one of Motown’s first all white groups-and if you think that that distinction falls to the chartbusting Rare Earth, you’d be wrong. Links to various ereader services included. Select the one which is relevant to you. I went the google play route since I had an account already set up. Neil’s all over the map in this exerpt. But it’s nice to experience his “voice” over many topics we have come to be familiar with. NEW YORK — Neil Young has a special gig in New York City this June at the annual publishing convention, BookExpo America. He will speak on stage at the Jacob Javits Center with an interviewer to be named later. One possibility: Stephen Colbert, who has interviewed Young on his Comedy Central show and is already a featured speaker at BookExpo.